It has been said that when explorer Duarte Coelho Pereira first laid eyes on a small area of land situated on a hill in the Northeast of Brazil his first words were, “Oh, Linda,” meaning “Oh, Beautiful” in Portuguese. 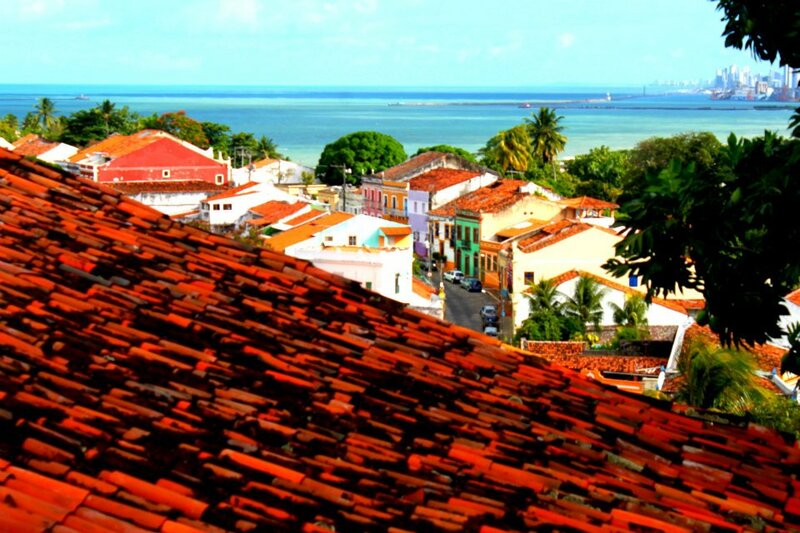 That was just the beginning of how the town of Olinda became the first European settlement of Pernambuco in 1535 and its allure is as strong today as it was back then. Just a short drive north from the state’s capital of Recife, Olinda is a much needed break from the hustle and bustle of the city. Here there are no skyscrapers or throngs of people waiting for the bus. Instead, you’ll find a quaint town overlooking the Atlantic ocean. Colorful homes line one cobblestoned street after another and whichever direction you turn it’s likely that you’ll run into a church dating back to the 1500’s. For many American tourists, the draw of bigger cities such as Rio de Janeiro and Sao Paulo seem to overshadow this small village. However, a visit to Olinda is an opportunity to experience one of the oldest and best preserved colonial cities in Brazil. For those who decide to explore this colorful city basic Portuguese is a must as most locals do not speak English. Despite the language barrier the people here are welcoming and friendly. A new appreciation for hand gestures and other non-verbal cues will surely be acquired as you navigate your way through the curvy streets. Olinda is known for its many churches and exploring any of the one’s dotted throughout the city is a great way to begin the day. The Church of São Salvador do Mundo is as good a place as any to begin as it sits atop the highest hill in the city. It began as a small chapel erected by the city’s founder and has been rebuilt and renovated many times since making it the beautiful, ornate site that it is today. Not far from this church is Oficina do Sabor (Rua Amparo, 335) , a must for lunch. Perhaps most famous for their pumpkins filled with various meat and curries, this is one of the best-known restaurants in the area. My favorite dish is the Camarão Tamarineira, shrimp served in a tamarind sauce accompanied by a banana puree and coconut rice. Enjoy your meal with a caipifruta, a traditional Brazilian drink made with Cachaça (sugar cane rum) and a variety of fruits. Not only is it delicious but with its colorful blend of fruits, it may also be one of the most beautiful drinks I’ve ever had the fortune of drinking. You won’t find shopping malls in Olinda but who needs price scanners and food courts when the Brazilian breeze is calling your name? Here, you’ll stumble upon many small markets and shops throughout the day where vendors sell everything from homemade crafts and clothing to traditional street food. If you really want to live like the locals order Tapioca ,savory or sweet depending on your mood, and wash it down with fresh coconut water. For a more adult beverage head to Licoteria (Rua Santa Tereza, 1190) where the proprietor makes his own liquors using his grandmother’s recipes. The flavors are interesting and include coffee, rose and lime. I recommend trying the Leite (milk) liquor. While it sounds odd, the flavor is sweet and smooth, reminiscent of a butterscotch candy. Like any true South American city, the magic happens at night. That’s when the locals come out and start to fill the air with the sounds of Brazil. No need to spend money on a show as music is heard from every direction with impromptu band practices and street performers. Just sit back and appreciate the unique rhythms as you look back on your day in this small gem on the sea. The streets of Olinda are as colorful as the people. Enjoying fresh coconut water as I explore Olinda. A night out with friends at Licoteria (Rua Santa Tereza, 1190). Great food at Oficina do Sabor (Rua Amparo, 335). A colorful caipifruta at Oficina do Sabor (Rua Amparo, 335). The Church of São Salvador do Mundo. Note: This piece was originally published in the Winter 2012 issue of Eidé Magazine.